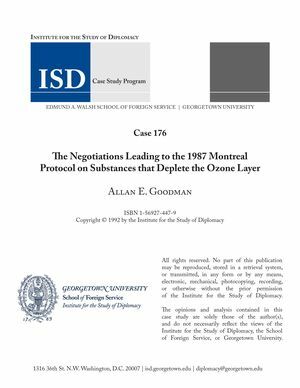 This case study examines the international negotiations leading to the 1987 Montreal Protocol, designed to control and reduce emissions of chlorofluorocarbons. The 1985 discovery of a growing hole in the ozone layer over Antarctica prompted the Reagan administration to intensify discussions with domestic economic interest groups and their foreign counterparts to eliminate the industrial use of CFCs. This case study illustrates the value of consulting domestic interest groups, as well as the interagency community, to develop a workable negotiating strategy. It also allows students to assess the effectiveness of public diplomacy and confrontational politics in breaking deadlocks and hastening progress at multilateral conferences.